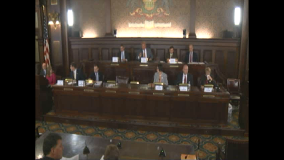 House Environmental Resources & Energy Committee - Informational meeting to consider imposing a severance tax on natural gas production. House Environmental Resources and Energy Committee - Voting meeting on HR 60, HB 1103, HB 1712, HB 1737, and any other business that may come before the Committee. Voting Meeting House Bill 398. Public hearing on HR 426. Environmental Issues Forum - Pennsylvania's Abandoned Turnpike. Public hearing on EPA Coal Regulations.